The vitamin C therapy of Abram Hoffer is safe, tested and effective for most cancers, regardless of type or stage. The author controlled his aggressive prostate cancer for 14 years primarily with vitamin C. He never had surgery, radiation, chemotherapy, or pain. 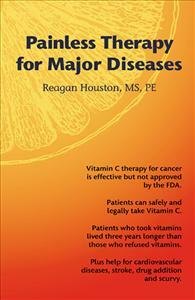 The FDA has penalized doctors who used vitamin C for cancer therapy. Patients are not restricted by FDA. The author offers strategies to get the cooperation of doctors. Hoffer’s vitamins are effective either alone or combined with regular therapies. For some patients , Hoffer’s vitamins may be the only therapy needed." Vitamins, added to regular therapies, have helped patients live much longer. Abram Hoffer, MD, PhD, demonstrated proper dosages for common vitamins A, B, C, D and E plus selenium and zinc. Hoffer tested 134 patients with many types of advanced cancer who also received standard cancer therapies. He recommended a low-fat and low-sugar diet plus vitamins. Those who chose vitamin therapy lived 45 months versus 2.6 months for those who refused vitamins. 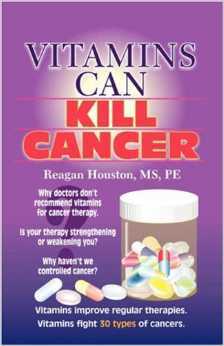 Vitamins Can Kill Cancer explains why vitamins work, why vitamins are underused and how patients can safely use vitamins to combat cancer.